Background: GST Council in its 27th meeting held on 4 thMay, 2018 had approved the basic principles of GST return design. Now in its 28th meeting held on 21st July, 2018, GST Council approved the key features and new format of the GST returns. This brief note lists the salient features of the new return format and business process for the information of trade and industry and other stakeholders. 6. Unidirectional Flow of document: Only the invoices or debit notes uploaded by the supplier on the common portal shall be the valid document for availing input tax credit by the recipient. Invoices or debit notes which have not been uploaded by the supplier and on which recipient has availed input tax credit shall be hereafter called “missing invoices”. Where credit is availed on missing invoices by the recipient and such missing invoices are not uploaded by the supplier within the prescribed time period, input tax credit availed in relation to such invoices or debit notes shall be recovered from the recipient. Thus, input tax credit shall inter-alia be dependent on uploading of invoices or debit notes by the supplier either before or after filing of the return, within the prescribed time limit. 7. Missing invoice reporting: Missing invoices shall be reported by the supplier in the main return for any tax period with interest or penalty as applicable. Reporting of missing invoices by recipient can be delayed up to two tax periods to allow recipient to follow up and get the missing invoice uploaded from the supplier. For example, purchase invoices received by recipient in April on which input tax credit has been availed but not uploaded by the supplier, shall be reported by the recipient not later than the return of June filed in July. Information about missing invoice uploaded by the recipient shall be made available to the supplier. Taxpayers filing quarterly returns shall report missing invoices in the next quarter. iii. GSTIN of the supplier. 9. 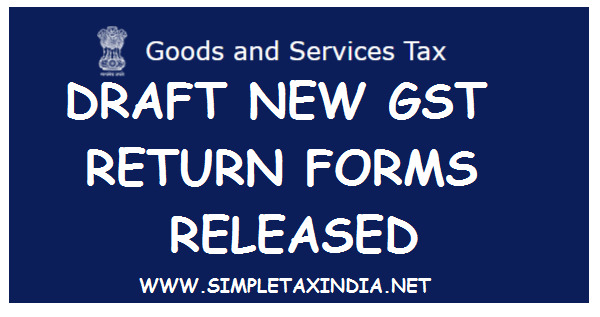 Payment of tax: Liability declared in the return shall be discharged in full at the time of filing of the return by the supplier as is being done at present in the present return FORM GSTR 3B. 10. Recovery of input tax credit: There shall not be any automatic reversal of input tax credit at the recipient’s end where tax has not been paid by the supplier. In case of default in payment of tax by the supplier, recovery shall be first made from the supplier and in some exceptional circumstances like missing taxpayer, closure of business by the supplier or supplier not having adequate assets or in cases of connivance between recipient and the supplier, etc. recovery of input tax credit from the recipient shall be made through a due process of service of notice and issue of order. 11. Locking of invoices: Locking of invoices means a handshake between the recipient and supplier indicating acceptance of entering into the transaction reported in the invoice. Facility for locking of invoice by the recipient before filing of the return by him shall be available. However, it may not be possible to lock individual invoices where the number of invoices is large and in such situation deemed locking of invoices shall be presumed on the uploaded invoices which are either not rejected or kept pending by the recipient. On filing of the return by recipient, all invoices shall deemed to be accepted except invoices kept pending or rejected. 12. Rejected invoices: Where the GSTIN of the recipient is wrongly filled by the supplier, the invoice would appear on the viewing facility of a taxpayer who is not the recipient of such supplies and therefore input tax credit is not admissible to him. Recipient shall report such invoices as rejected invoices. To assist the process of rejecting invoices with ease, the matching IT tool shall have facility to create recipient and seller master list, from which correct GSTIN can be matched. 13.1Pending invoices: Pending invoices means such invoices which have been uploaded by the supplier but for which one of the three situations exist – first, the supply has not been received by the recipient, second, where the recipient is of the view that the invoice needs amendment, third, where recipient is not able to decide whether to take input tax credit for the time being. Pending invoices shall be reported by the recipient and no input tax credit shall be availed by the recipient on such pending invoices. To reduce the number of pending invoices which needs to be reported, a simplification in the procedure for availing input tax credit shall be carried out as detailed in para 13.2 below. 13.2 The simplification process would be that where the goods or services have been received by the recipient before filing of a return and invoice for the same has been uploaded by the supplier upto the due date i.e 10th of the next month, input tax credit for the same can be availed by the recipient in the return. This is likely to make additional credit available to the recipient as goods or services received after 1st of next month but before 20th become eligible for availing input tax credit. For example, input tax credit can be availed by the recipient on invoice issued in April and uploaded by the supplier by 10th May even if the goods or services have been received by the recipient before 20th May i.e. the date on which he is filing his return for the month of April (presently he is eligible for input tax credit only if goods or services have been received by 30th April). 13.3 A pending invoice can be rejected by the recipient at a later date when he is able to decide on either of the three situations mentioned in para 13.1 above. 14. Deemed locking of invoices: Invoices which have been uploaded by the supplier and made available in the viewing facility to the recipient but have not been rejected or have not been kept pending by the recipient shall be deemed to be locked after return for the relevant tax period has been filed by the recipient. It may also be noted that invoices on which credit has been availed by the recipient (i.e. locked invoices) will not be allowed to be amended by the supplier and in order to amend the reported particular of such invoices, a credit or a debit note will have to be issued by the supplier. 15. Unlocking of invoices: A wrongly locked invoice shall be unlocked online by the recipient himself subject to reversal of the input tax credit by him and online confirmation thereof. (ii) where a credit note is issued on an invoice on which credit has already been availed i.e. the invoice is locked, the reduction in liability of supplier shall be subject to reduction in input tax credit of the recipient. 17. HSN: The table for reporting supplies with the tax liability at various tax rates shall not capture HSN but would continue to capture supplies at different tax rates as is the present practice. The details of HSN shall be captured at four digit or more in a separate table in the regular monthly return. 18. Return format: The main return shall have two main tables, one for reporting supplies on which tax liability arises and one for availing input tax credit. Return shall have annexure of invoices which shall auto-populate the output liability table in the main return. 19. Payment of multiple liability: Liability in the return arising out of invoices of different dates shall be summarized period wise. However, one payment for the total tax liability on all tax invoices shall be allowed to be made. For example, a missing invoice of April if needed reporting in September, would be reported in the regular return of September. However, the liability for the month of September and April shall be shown separately on the common portal to the taxpayer in the regular return of September but one consolidated payment would be required to be made. Interest shall be calculated on invoices reported late i.e. in the present example on the invoice of April. After filing of the return, information relating to April invoice shall be clubbed with the information relating to April information. 20. Amendment return: To address the problem of human error i.e. wrong entries being made in the return, there would be a facility for filing of amendment return. Amendment return is different than a regular return. There would be a facility to file two amendment returns for each tax period within the time period specified in section 39(9) of the CGST Act, 2017. Amendment of entries which flow from the annexure of the main return shall be allowed only with the amendment of the details filed in the annexure. 21. Amendment of missing invoices: Amendment of missing invoices reported later by the supplier shall be carried out through the amendment return of the relevant tax period to which the invoice pertains. Therefore, it would be advisable to report all the invoices and then avail the facility for amending return so that invoices reported late can also be amended through the amendment return. For example, Invoice of April if uploaded in September shall get amended with the amendment of return for the month of April only and therefore trade is advised to report all the missing invoices before exhausting their opportunity to amend the return. 22. Amendment of details other than that of invoice: All user entries of input tax credit table in the main return would be allowed to be amended. This is necessary as amendment of subsequent returns should not be necessary with respect to the input tax credit table to keep the compliance load under control. Change in the closing balance of the input tax credit shall be affected based on the declaration in the amendment return of the taxpayer. Thus, the opening and closing balances of intervening month(s) shall not get impacted. 23. Payment due to amended liability: Payment would be allowed to be made through the amendment return as it will help save interest liability for the taxpayer. Input tax credit, if available in the electronic credit ledger can also be used for payment of the liability in the amendment return. 24. Negative Liability: Negative liability arising from the amendment return shall be carried forward as negative liability in the regular return of the next tax period. 25. Higher late fee for amendment return: For change in liability of more than 10% through an amendment return, a higher late fee may be prescribed to ensure that reporting is appropriate in the regular return. 26. Monthly Accounting: All reported liabilities for a month in regular return for a tax period, liabilities from missing invoices uploaded/reported later and liability flowing from the amendment return shall be shown to the taxpayer and the tax officer at one screen on the common portal to assist tax period wise accounting and assessment. 27. Exports: The table for export of goods in return would contain details of the Shipping Bill also. The registered person can either fill this information at the time of filing the return or after filing the return at his option. Filing the details of the Shipping bill in the return at a later date shall not be considered as filing of an amendment return. A separate facility for uploading shipping bill details at a later date shall be provided to the exporters. 28. Transmission of data to ICEGATE: Once the information of S/B is completed, the entire data shall be transmitted to the ICEGATE (IT system of Customs administration). Subsequent amendments in export/Shipping Bill table shall also be carried out through a separate facility on the common portal and not through the process of filing of amendment return. There would thus be a special facility for the exporters. This amended data would also be transmitted to ICEGATE. 29. Integrated flow of information: Till data starts flowing online from ICEGATE or SEZ online in the input tax credit of the return, credit on imports and supplies from SEZ shall be availed on self-declaration basis. 30. Supply side control: For a newly registered taxpayer and a taxpayer who has defaulted in payment of tax beyond a time period and/or above a threshold, uploading of invoices shall be allowed only upto a threshold amount or only after the default in payment of tax is made good respectively. This would lead to the recipient getting protected against the actions of the supplier and also the interest of public money (revenue) adequately protected. Where the condition for supplier’s side control are not satisfied due to default in payment of tax by the supplier, the invoice of such supplier shall not be populated in the viewing facility of the recipient and consequently, the recipient would not be able to avail input tax credit on such invoices till the default in payment of tax by the supplier for the past period is made good. 31. Profile based return: There are many kinds of supplies which can be made under GST and also there are many types of inputs using which input tax credit can be availed. Most of the taxpayers have only a few types of supplies to make and few types of inputs to report. Therefore, a questionnaire shall be used to profile the taxpayer and only such part of return shall be shown to him which are relevant to his profile. For example, a small manufacturer or trader, buying and selling locally may need to file a return consisting of only a few lines. Profiling would allow fields like export, supplies to and from SEZ to be blocked from return and make return adequate for his purpose. 32. Purchase information in the annual return: Invoices/ Supplies on which the recipient does not intend to take input tax credit (such as ineligible ITC supplies) but are kept pending or rejected will have to be reported separately in the Annual return. 33. Suspension of registration: Concept of suspension of registration would be introduced when a registered person has applied for cancellation of registration or when the conditions in law for cancellation of registration are satisfied. From the date of suspension to the date of cancellation of registration, return would not be required to be filed and also invoice uploading shall not be allowed for the period beyond the date of suspension. 1. Quarterly filing and monthly payments: It is proposed to provide facility for filing of quarterly return to small taxpayers, who had a turnover upto Rs. 5 Cr. in the last financial year. The turnover shall be calculated in the manner explained in para 1 of Part A above. However, they would still need to pay their taxes on monthly basis and avail input tax credit on self-declaration basis to pay the monthly taxes. 2. Quarterly or monthly return: Option for filing monthly or quarterly return shall be taken from these small taxpayers at the beginning of the year and generally thereafter they would continue to file the return during the year as per the option selected. During the course of the year option to change from monthly to quarterly or vice-versa shall be allowed only once and at the beginning of any quarter. This is necessary to avoid confusion for the taxpayer and also to avoid complex validations in the IT system. 4. Quarterly Return: Option to create profile in the quarterly return shall also be available. Sahaj and Sugam are predetermined profiles of the quarterly return. 5. Sahaj and Sugam Returns: Small taxpayers often have purchases only from the domestic market and sales in the domestic market i.e B2B purchases locally and supplies either as B2C or B2B+B2C. They constitute a very large part of the tax base and therefore two simplified quarterly returns are proposed for them respectively. They have been named as “Sahaj” (only B2C outward supplies) and “Sugam” (both B2B and B2C outward supplies). In effect, these returns are pre-determined profiles for small taxpayers using quarterly return. 6. Uploading of invoices: The recipients from these small taxpayers would need uploaded invoice for availing input tax credit and therefore the small taxpayers would be given facility to continuously upload invoices in the normal course. The invoices uploaded by 10th of the following month would be available as input tax credit to the recipient in the next month as is the case in case of purchases from large taxpayers. 7. Payment declaration form for payment of monthly taxes: These small taxpayers would continue to pay taxes on monthly basis and in the first and second month of every quarter, they would use a payment declaration form to make the payment. In the payment declaration form, self-assessed liability and input tax credit on self-declared basis shall be declared. To assist in tax payment and availing input tax credit, necessary liability arising out of uploaded invoices of outward liability and input tax credit flowing from viewing facility would be shown to the taxpayer. The payment declaration form shall only allow full payment of the liability arising out of uploaded invoices. Late payment of tax liability including that in first and second month of the quarter shall attract interest liability. 8. Lower compliance cost: The benefit of this simplification would be that the compliance cost for small taxpayers would come down as payment declaration form is not a return and minor errors in the same would not lead to initiation of any legal action. 9. HSN: HSN wise details would need to be provided at 4 digit level or more in the quarterly return. 10. Pending and missing invoices: Small businesses have only a few supplies to receive and therefore they track their purchases well and may not need credit on missing invoices. As the inventory size of these businesses is small they also do not need to keep invoices pending and generally avail credit forthwith. Therefore quarterly return shall not have the compliance requirement of missing and pending invoices as small businesses do not use these procedures in their inventory management.